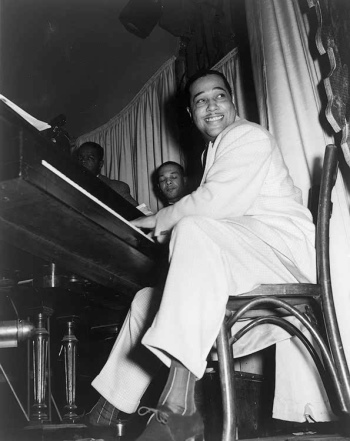 Far more than just another piano playing bandleader, Edward Kennedy "Duke" Ellington (1899 - 1974) was and still remains a powerfully influential figure in the world of music. Whether it was in jazz, popular song, big bands, or modern classical-form compositions, Ellington's orchestras always led the way, featuring stylish and innovative arrangements, memorable performances by a wide range of talented vocalists and solo performers, and the sheer showmanship of their handsome and charismatic leader. Radio always played a significant role in the popularity of Ellington's orchestras, whether it was the early 1930s weekly broadcasts from the Cotton Club, 1940s late-night remotes from ballrooms and hotels, or a string of guest appearances on popular network variety shows. 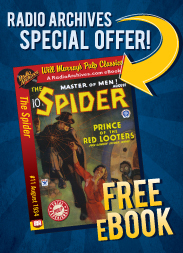 However, toward the end of World War II, to promote the Seventh War Loan drive, the United States Treasury Department sponsored a series of broadcasts featuring live in-person performances by Ellington and his orchestra. 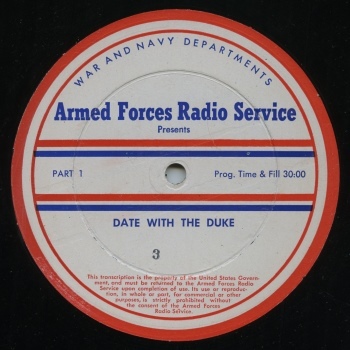 Aired for one hour each week, "Your Saturday Date with the Duke" proved to be a popular feature on the fledgling ABC Radio Network. Broadcast from a variety of locations - usually night clubs or theaters where the Ellington band was being featured - and always attended by a wildly enthusiastic audience, the programs featured a wide array of compositions old and new. Listeners enjoyed classics from Ellington's band book, popular songs, familiar Duke Ellington/Billy Strayhorn compositions, excerpts from many of Ellington's longer compositions, and many rarely heard pieces - some of which were never commercially recorded. Military personnel, unable to hear these live broadcasts due to their faraway assignments, were lucky in that the Armed Forces Radio Service chose to record and edit the shows for rebroadcast via shortwave throughout the world. Editing the one-hour shows into a series of thirty minute weekly features, retitling them "Date with the Duke", and distributing them on 16" vinyl transcriptions, Ellington's fans all over the world also had the chance to hear the smooth, swinging, and rousing sounds of a band that many consider one of Ellington's very best. Heard today, the twenty half-hour broadcasts featured in this set remain a fascinating glimpse into the musical world of the mid-1940s. The enthusiastic big-city audiences in attendance clearly motivate the musicians to new musical highs and soloists, not restricted to the three-minute lengths imposed by 10" 78 RPM records, often extend the length of the selections to five or six minutes of delightful free-form jazz. Ellington's piano solos are a highlight, of course, as are the vocals of Al Hibbler, Kay Davis, Joya Sherrill, Ray Nance, and others. Transferred directly from a series of original Armed Forces Radio Service transcriptions and painstakingly restored by Radio Archives, these rare and exciting programs capture Duke Ellington and his Orchestra in their prime. Whether you're a long-time fan of the Duke or discovering his music for the first time, this collection is bound to hold an honored place in your music library. I bought the "Date with the Duke" some time ago. It deserves five stars for quality, price and presentation. Please issue more from the same source. I was glad to see you do another music set. You do such a wonderful job with your sets that I find myself wanting to get more; I'd be thrilled if you'd offer more popular music (jazz, big bands), and also Jimmy Durante, and Al Jolson.